As you might know October is Breast Cancer Awareness Month. Unfortunately so many of us are confronted one way or the other with this terrible disease, and that's why charities like Pink Ribbon, which raise worldwide awareness and help fund research, are so very very important. 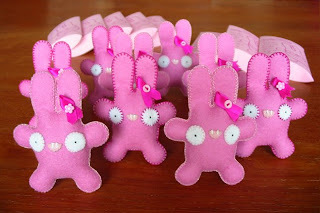 To support this terrific cause I made some cute felt Pink RibBunnies. All proceeds of the Pink RibBunnies will be donated straight away to Pink Ribbon International. Help show your support by adopting a Pink RibBunny! 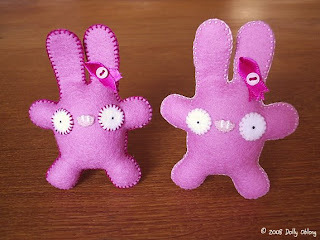 Pink RibBunnies are hand crafted out of wool felt, embroidery thread and a dollop of polyfil. They measure 9cm (3,5 inch) from top to toe and about 7cm (2,8 inch) from left to right. 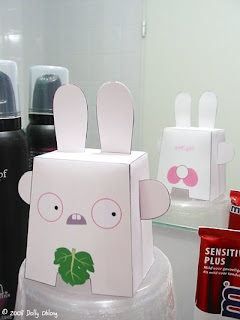 Each Pink RibBunny comes in its own nifty pink packaging. 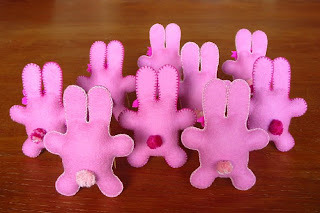 Once again, all proceeds from these bunnies will be donated to Pink Ribbon to benefit breast cancer research. Please feel free to visit www.pinkribbon.org for more information. Baldwin is back! 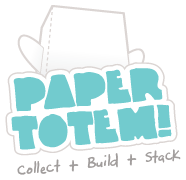 Yes this rare species of bunnies now has its very own paper alter ego to "bunny up" your living space. Do you want your own fig leaf wearing pink bottomed paper bunny? Just download your free Paper Baldwin here. As usual just cut out + glue + attach arms & ears.